Antonio Tricarico appeared on Democracy Now! yesterday to discuss the Italian financial crisis following his inclusion on an IPA news release. Among his interviews were appearances in the New York Times and Al-Jazeera English. Nathan Schneider, after his appearance on an IPA news release near the start of the Occupy movement, has appeared in a number of prominent media outlets. He discussed the roots of the movement on “All Things Considered” at the end of September. NPR also cross-posted an article he wrote for The Nation. 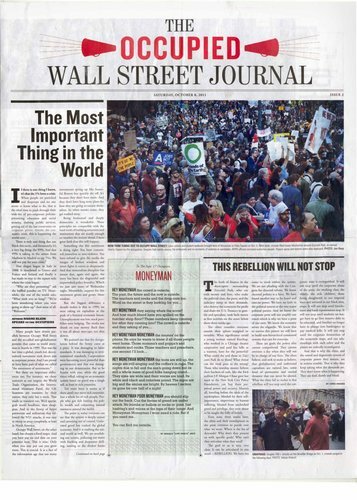 He appeared in the New York Times to address some of the challenges facing Occupy Wall Street. Among other sites, Schneider also made his way into an Al-Jazeera English article and appeared on-air on October 2. Following his appearance on an IPA news release, Thomas Ferguson spoke about Occupy Wall Street and congressional taxation debates on Uprising Radio. Listen to the interview here. Following his appearance on an IPA news release on Thursday, Francis Boyle was quoted in the Wall Street Journal Saturday discussing options for Palestinians seeking statehood if the U.S. vetoes the nation’s efforts to gain recognition through the UN Security Council. Boyle, an adviser to Palestinian Authority President Mahmoud Abbas, believes the UN General Assembly could also be a potential route to membership. It would take a two-thirds vote in the General Assembly to grant Palestine membership. Following his appearance on an IPA news release Monday Ralph Nader appeared on both America’s Radio News and Democracy Now to discuss Obama’s bypassing of Elizabeth Warren to head the Consumer Financial Protection Bureau. Check out both interviews here and here. Gareth Porter appeared on Democracy Now! this morning to address Obama’s newly-announced plans to scale back troops in Afghanistan. Watch it here.